The Hotel San Moisè is very close to the most popular sights and shopping areas, yet it has a quiet, romantic location next to a canal where you can see--and hear--gondola serenades year-round. The San Moisè has a traditional, old-fashioned Venetian decor and ambience, with plenty of beamed ceilings, terrazzo floors, and Murano glass chandeliers. It enjoys high user ratings from Booking.com, our hotel partner, which conducts surveys of paying guests. 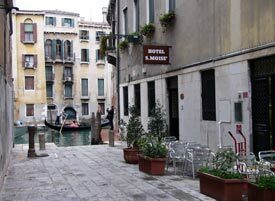 ABOVE: The Hotel San Moisè is on a quiet street next to Venice's most musical canal. When my son and I stayed at the Hotel San Moisè, we booked a canal-view room through Venere at a favorable off-season rate and spent a night at the San Moisè after a cruise from Venice. The fact that we enjoyed our stay at the three-star Hotel San Moisè after a week of cruising luxury speaks well for the hotel's standards of decor, comfort, and housekeeping.